As the Brown population begins to delve fully into midterms, and the golden hues of New England’s most beautiful season arrive in Providence, it’s a good time to take a step back and explore the uniquely quirky Ocean State in which students live for 4 years: trips down to Newport, hikes in Lincoln Woods, drinking Narragansett beer. The best part? One of those activities can be done without leaving one’s dorm room! It gets better. Narragansett, already a RI favorite, has recently released two fall beers inspired by various aspects of the smallest state in the union. Enter the Reanimator Helles Lager and the Double Chocolate Porter. The Reanimator Helles Lager, an altered version of Narragansett’s previously retired Bock beer, is the third in the brewery’s series of beers inspired by the horrific short stories of Providence local and legend HP Lovecraft. Like the previous two iterations of the Gansett-Lovecraft collaborative series, the brew is inspired by an individual story — in this case, “Herbert West – Reanimator”, a tale about a doctor obsessed with reviving the undead. The can features art designed by a local Providence designer Aaron Bosworth. As far as taste goes, the Reanimator could almost be a pale ale; it’s aggressively hoppy and floral, with an enduring sweetness throughout every sip. Many of Lovecraft’s stories center around beings the mere sight of which will drive a person mad, and at 6.5% ABV, a few of these beers will accomplish the same effect with a lot less effort. The second recent release is the Double Chocolate Porter, a collaboration with Kingston-based Allie’s Donuts, a local RI favorite. 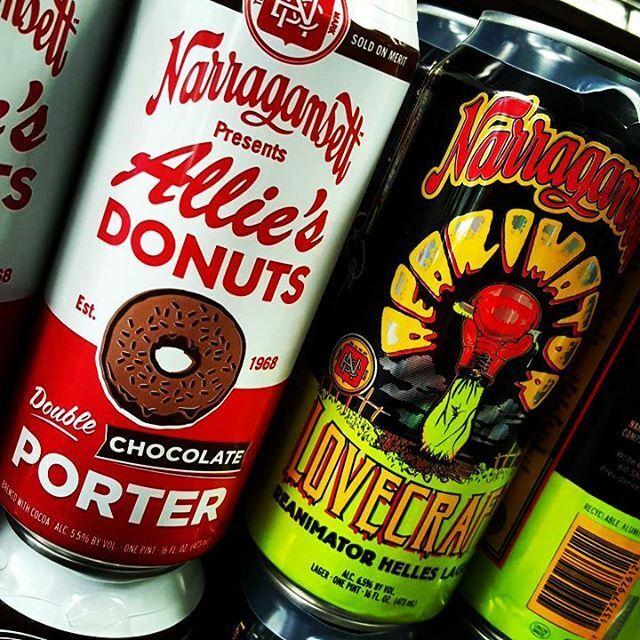 Narragansett has a history of partnering with iconic Rhode Island brands — namely, Del’s Lemonade and Autocrat Coffee Milk — for products like its Lemon Shandy and Coffee Stout. Their latest creation is ostensibly the brewery’s best effort at making a beer taste “donut flavored,” which is fine, because chocolate is weird enough already as a beer flavor (much less “double” chocolate). In actuality, the Double Chocolate Porter — as its name would suggest — is a sweet, chocolaty, heavy beer with a bitter aftertaste and the tiniest hint of vanilla. At 5.5% ABV, the beer isn’t terribly strong, and generally heavy enough that drinking more than a can or two at once would be a tall order. Both the Reanimator Lager and the Chocolate Porter can be found in 16 oz tallboys in liquor stores throughout Rhode Island and the rest of New England.